Objective Older patients with hip fractures who are undergoing surgery are at high risk of significant mortality and morbidity including postoperative delirium. It is unclear whether different types of anaesthesia may reduce the incidence of postoperative delirium. This systematic review will investigate the impact of anaesthetic technique on postoperative delirium. Other outcomes included mortality, length of stay, complications and functional outcomes. Design Systematic review of randomised controlled trials and non-randomised controlled studies. Data sources Bibliographic databases were searched from inception to June 2018. Web of Science and ZETOC databases were searched for conference proceedings. Reference lists of relevant articles were checked, and clinical trial registers were searched to identify ongoing trials. Eligibility criteria Studies were eligible if general and regional anaesthesia were compared in patients (aged 60 and over) undergoing hip fracture surgery, reporting primary outcome of postoperative delirium and secondary outcomes of mortality, length of hospital stay, adverse events, functional outcomes, discharge location and quality of life. Exclusion criteria were anaesthetic technique or drug not considered current standard practice; patients undergoing hip fracture surgery alongside other surgery and uncontrolled studies. Results One hundred and four studies were included. There was no evidence to suggest that anaesthesia type influences postoperative delirium or mortality. Some studies suggested a small reduction in length of hospital stay with regional anaesthesia. There was some evidence to suggest that respiratory complications and intraoperative hypotension were more common with general anaesthesia. Heterogeneity precluded meta-analysis. All findings were described narratively and data were presented where possible in forest plots for illustrative purposes. Conclusions While there was no evidence to suggest that anaesthesia types influence postoperative delirium, the evidence base is lacking. There is a need to ascertain the impact of type of anaesthesia on outcomes with an adequately powered, methodologically rigorous study. This systematic review provides an update to evidence that examines whether the type of anaesthesia affects the development of postoperative delirium in patients with hip fractures. 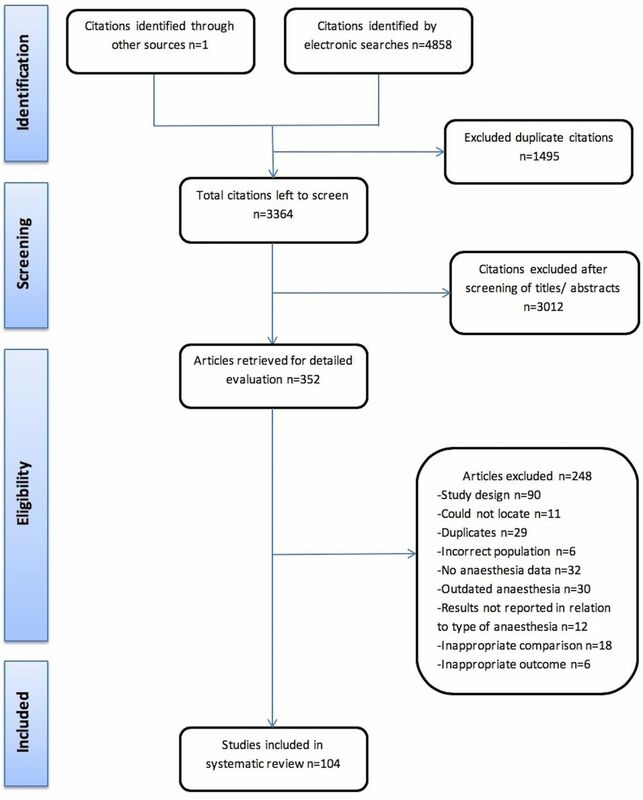 The review included randomised and non-randomised studies that included one or more types of regional versus one or more types of general anaesthesia provided they are in current use as described in the UK. Other outcomes were mortality, length of hospital stay, adverse events, functional outcomes, discharge location and quality of life. Findings from previous systematic reviews looking at the effects of type of anaesthesia on postoperative outcomes in patients with hip fracture are broadly suggestive of improved outcomes3 5 23 24 and reduced incidence of postoperative delirium in patients having RA.3 5 22 25 26 However, some studies included in these reviews reported use of outdated anaesthetic drugs that are no longer relevant to current clinical practice.5 24 Further limitations were the inclusion of only randomised controlled trials,3 5 23 24 lack of focus on delirium as a primary outcome,3 5 22 24 26 a limited search strategy22 and restrictive selection criteria (eg, exclusion of studies with patients with cognitive impairment).23 25 26 Inadequate exploration of heterogeneity relating to delirium assessment and rating scales and assessment time points was also common. This systematic review aims to provide an up-to-date, comprehensive and methodologically robust analysis to examine the effect of RA versus GA on postoperative delirium and other outcomes in older patients undergoing surgery for hip fracture. Bibliographic databases (Embase, MEDLINE, CINAHL and the Cochrane Library (CENTRAL)) were searched from inception to June 2018 using a combination of index terms and keywords relating to the population, intervention and comparator (see online supplementary appendix A for sample search strategy). There was no restriction by search date, study design or language. Web of Science and ZETOC databases were searched for conference proceedings. Reference lists of relevant articles were checked, and clinical trial registers (www.clinicaltrials.gov, www.isrctn.com and http://www.who.int/ictrp/en/) were searched to identify ongoing trials (online supplementary appendix B). Endnote V.7 (Thomson Reuters) was used to store records and facilitate screening. Population—patients aged ≥60 years (or with a majority ≥60) undergoing surgery for fragility hip fracture. Outcomes—primary outcome: postoperative delirium (any criteria as defined by study authors); secondary outcomes: mortality, length of hospital stay, adverse events, functional outcomes, discharge location and quality of life. Randomised or non-randomised controlled studies (prospective or retrospective). Exclusion criteria for the primary outcome of ‘postoperative delirium’ were anaesthetic technique or drug not considered current standard practice (eg, outdated anaesthetic agents—halothane, enflurane, xenon); patients undergoing hip fracture surgery alongside other surgery (eg, multiple trauma injuries); uncontrolled studies. Two reviewers (RC, VP) independently screened titles and abstracts. Any disagreements were resolved with the support of JY. Reasons for exclusion were recorded at the full text stage. A piloted, standardised data extraction form was used to record information on study design, patient characteristics, type of surgery, anaesthesia type and outcomes. The Cochrane Collaboration risk of bias tool29 was used to assess the methodological quality of randomised controlled trials and the Newcastle–Ottawa scale30 for non-randomised studies. Full translations could not be obtained for three included studies31–33; extracted data are therefore based mainly on numerical data and the English abstract. Data was extracted by RC and VP, with data checking by JY (for RC) and JD (for VP). Findings were grouped according to outcome. Where there was sufficient data, results were presented in forest plots (delirium, mortality and length of hospital stay). Results for studies not included in the forest plot were reported narratively. Effect estimates were not pooled as clinical and methodological heterogeneity was considered to be too great. Forest plots were thus used for illustrative purposes only and potential sources of heterogeneity (such as study design or timing of assessment) have been highlighted. Where studies did not report sufficient data for inclusion into a forest plot (eg, results reported narratively only, or a p value only stated) results or conclusions from the study were nonetheless described in order to report the totality of the available evidence. Occurrence of delirium and mortality were reported as relative risks or ORs; length of stay (days) was reported as a mean difference. Adverse events were tabulated, where possible, according to the postoperative morbidity survey (POMS) criteria.34 Findings for other outcomes (functional outcomes, quality of life and discharge location) were reported narratively as heterogeneity and/or a paucity of data precluded representation in forest plots. Formal sensitivity analysis according to study quality, and assessment of publication bias using funnel plots were not possible. This systematic review is part of a programme of research looking at impact of anaesthesia on postoperative delirium. The research programme has received input from patient partner and Clinical Research Ambassador Group at Heart of England National Health Service Foundation Trust. Of 4859 citations screened, 104 studies met the eligibility criteria (figure 1). There were 7 randomised controlled trials (RCTs), 34 prospective and 63 retrospective controlled studies. Preferred Reporting Items for Systematic Reviews and Meta-Analyses (PRISMA) flow diagram. The PRISMA diagram details our search and selection process applied during the review. Twenty-two studies reported delirium (5 RCTs,35–39 9 prospective18 40–47 and 8 retrospective studies48–55); 58 studies reported mortality (2 RCTs,35 38 12 prospective42 45 56–65 and 44 retrospective studies4 20 21 31 32 48 51 52 54 66–100); 25 studies reported length of hospital stay (2 RCTs,36 38 6 prospective42 45 58 101–103 and 17 retrospective studies21 51 57 68 70 71 75 78 80–83 95 98 99 104 105); 27 studies reported adverse events (4 RCTs,35 36 39 106 7 prospective42 43 45 58 101 107 108 and 16 retrospective studies20 21 48 51 52 68 69 71 75 79–81 95 96 109 110); 11 studies reported functional outcome (3 RCTs,35 36 111 4 prospective42 45 103 112 and 4 retrospective studies62 73 105 113); 5 studies reported discharge location (2 prospective43 114 and 3 retrospective studies21 48 99). Thirteen potentially relevant ongoing trials were identified, with three (ISRCTN15165914, NCT03318133 and NCT02213380) planning to measure delirium postoperatively (online supplementary appendix B). No interim data were available. Given the large number of studies identified, only the 22 studies reporting the primary outcome of postoperative delirium have been described in detail (table 1). Forest plot of studies reporting the unadjusted relative risk of postoperative delirium with GA compared with spinal anaesthesia. Some studies are represented more than once to show results for different definitions of delirium or for different assessment time-points. CAM, confusion assessment method; DSM-IV, Diagnostic and Statistical Manual of Mental Disorders, 4th edition; MFIP, Multi-factorial Intervention Program; MMSE, Mini–Mental State Examination; RR, relative risk; SC, standard care; UCD, unspecified cognitive dysfunction. Overall, there was substantial heterogeneity across the 22 studies regarding assessment tools, assessment time-points and anaesthetic protocol. Many assessment tools were poorly defined. Only 7 out of 22 studies used either DSM-IV criteria18 40 49 53 54 or Abbreviated Mental Test.35 50 Delirium or cognitive impairment was frequently not a primary outcome, but listed as one of several complications. The observational studies were generally considered to be at low risk of bias in terms of patient eligibility; however, most had no details on blinding of outcome assessors and the level of completeness of data (table 2B). There was variation in reporting and adjustment of potential confounding factors such as the American Society of Anesthesiologists Physical Status Classification System (ASA) score, age, gender, comorbidities, surgery type, time to surgery and physical function. There were no details on characteristics of patients who completed follow-up compared with those lost to follow-up. There was also a general lack of detail on the type of assessment tool used and/or where the cut-off for a ‘positive’ diagnosis of delirium was. Two RCTs reported mortality (table 3). One found a small and statistically significant survival benefit at 120 days and 1 year for GA, but no such benefit was evident at 30 or 90 days of follow-up.38 Ten observational studies reported adjusted results or results based on a matched analysis (table 3). Two of these20 68 found a statistically significant benefit in favour of RA for in-hospital mortality. The remaining eight studies found no significant differences. There was a lack of consistency across studies in terms of number and type of variables included in models. Of the remaining 46 studies (results not shown) reporting unadjusted mortality results only, six56 60 67 73 74 76 found statistically significant results in favour of RA. The remainder found no statistically significant differences or benefit comparing RA with GA. Overall, there is a paucity of good-quality evidence evaluating mortality, with only one good-quality RCT38 suggesting benefit from GA at later but not earlier time-points. Forest plot of studies reporting length of hospital stay. Weighted mean difference in number of days between GA and RA (GA minus RA). WMD >0 means longer stay for GA and favours RA. 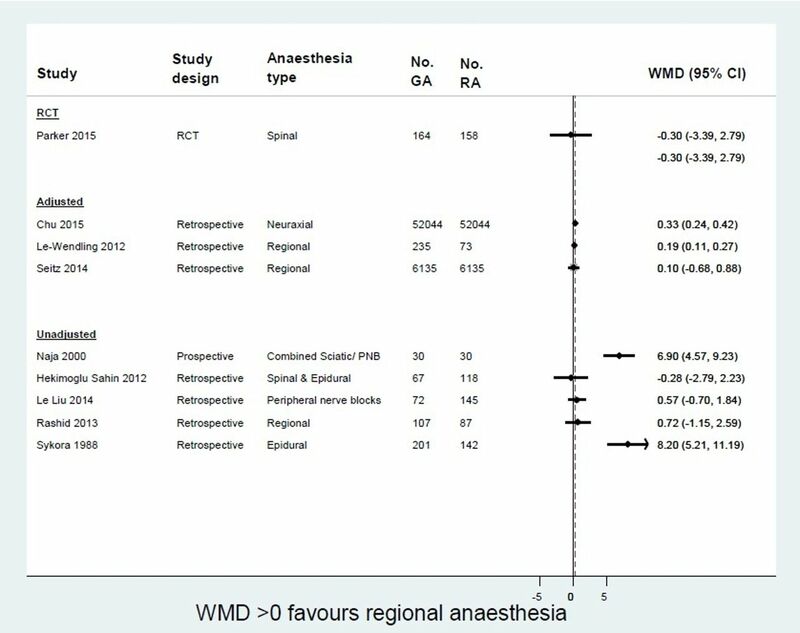 WMD <0 means longer stay for RA and favours GA. GA, general anaesthesia; RA, regional anaesthesia; RCT, randomised controlled trial; WMD, weighted mean difference. Twenty-seven studies reported adverse events (table 4). There were many gaps in reporting of POMS adverse events, and it is uncertain whether this reflects non-occurrence or non-reporting of such events. Most commonly reported adverse events were pulmonary (10 studies)20 21 35 45 48 49 62 69 89 91 and cardiovascular events (9 studies).21 35 39 48 58 68 69 81 95 For pulmonary events, six studies found no statistically significant differences.35 45 49 69 89 91 Four studies found a statistically significant difference in favour of RA (fewer cases of ventilatory support,68 respiratory failure20 68 and ‘overall pulmonary’ adverse events20 51). There were no differences in occurrences of pneumonia35 48 52 95 or hypoxia.75 101 The most commonly reported cardiovascular adverse events were myocardial infarction39 48 68 95 and thromboembolic events.35 58 69 81 95 No differences were found for myocardial infarction.39 48 52 68 75 95 Three studies69 81 95 reported higher incidence of thromboembolic events in GA group. Nine studies summarised overall adverse events with the majority finding no differences between the types of anaesthesia. Where there was a significant difference, this was in favour in RA (eg, fewer incidences of ‘all complications’,51 69 intensive treatment unit (ITU) admissions,68 stroke68 or requirement for blood transfusion). Three studies106 108 109 found higher incidences of hypotension in the GA group. The results are thus suggestive of a lower incidence of postoperative respiratory, cardiac and overall complications in the RA group. However, reporting of adverse events, including methods of ascertainment, was inconsistent and limited. Eleven studies reported functional outcomes using a variety of outcome measures. 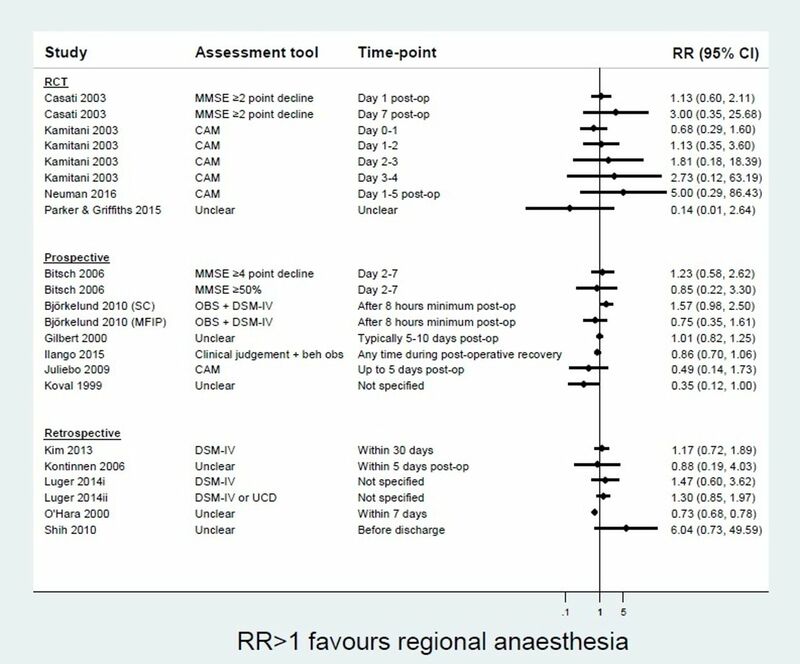 Two RCTs reported a significantly quicker time to ambulation in the RA group (3.3 days RA vs 5.5 days GA)35 and a statistically significant earlier discharge time from PACU (post-anaesthesia care unit) in the RA group (RA 15 (5–30) min vs GA 55 (15–80) min, p=0.0005).36 However, one RCT found that patients given RA were slower to be discharged from PACU (mean time to discharge GA 35.04 min (SD 3.39) vs RA 41.26 min (SD 8.37), p=0.001).111 No significant differences were found in the non-randomised studies regarding time to ambulation,103 112 113 walking speed,62 time to rise from chair,42 mean Barthel’s score73 or ambulation at 3, 6 and 12 months post surgery.45 105 Overall results may suggest a small benefit from RA for immediate post-anaesthetic mobilisation. However, the evidence is limited by small sample size, unknown method of outcome assessment and blinding of assessors. Five non-randomised studies described discharge locations of patients following hip fracture.21 43 48 99 114 One study with only 14 patients reported that more patients returned home in the RA group.45 A large retrospective study reported lower odds of returning to home residence and higher chance of admitting to healthcare facility in GA group compared with RA (16 695 patients, return home adjusted OR 0.91 (95% CI 0.84 to 0.97); healthcare facility admission OR 1.10 (95% CI 1.03 to 1.19).99 A cohort study of 4815 patients found operation under GA significantly increased risks of rehabilitation admission instead of home (adjusted OR 1.74, 95% CI 1.34 to 2.25, p<0.001).114 However, two larger studies21 109 found no difference in discharge location between GA or RA groups. There were no studies that evaluated the effect of type of anaesthesia on quality of life in patients after hip fracture surgery. For the primary outcome of postoperative delirium, this systematic review did not find any difference between types of anaesthesia. Furthermore, no survival benefit could be demonstrated with either type of anaesthesia up to 1 year postoperatively. A small number of studies suggested that fewer adverse events might be associated with RA. Similarly, some studies were suggestive of a small reduction in hospital stay with RA. Data were limited for functional outcomes and discharge data. Two small RCTs suggested a benefit from RA for immediate post-anaesthetic mobilisation. There were no studies that reported on quality of life after different types of anaesthesia. This is the most comprehensive and methodologically robust systematic review to date. It includes both RCTs and non-randomised controlled studies, focusing on delirium as a primary outcome as well as synthesising findings for a range of other important outcomes including adverse events. Results for RCTs, non-randomised studies, adjusted and unadjusted results were presented and considered separately. It was anticipated that non-randomised studies, which are more prone to bias, may overestimate effect sizes compared with RCTs. No such trends were observed, however, as studies of any design mostly showed no difference in effect. A sensitive search strategy means it is unlikely that many studies would have been missed. Careful consideration of heterogeneity has meant that no meta-analyses were undertaken, but results were presented in forest plots where possible to show the overall direction of effect and heterogeneity between studies. Delirium can be diagnosed using the criteria from the DSM-V or WHO’s ICD-10 classification of diseases.7 115 However, in clinical practice, the criteria can be difficult to apply116 and tools such as the confusion assessment method, Delirium Rating Scale revised-98, Neelon and Champagne Confusion Scale117 or 4 ‘A’s’ Test have been advocated as validated screening tools.6 116 118 No consensus exists in the literature as to which tool should be the gold standard.6 119 120 The accurate assessment of delirium can be affected by the presence of pain and residual drugs in the immediate period following surgery; therefore, timing of assessment is also important.121 No significant differences were found for the incidence of postoperative delirium, based on 4 RCTs and 14 non-randomised studies, but there were significant differences in the assessment tools and the assessment time-points. Most of the RCTs were small and most likely underpowered. In the largest RCT,38 delirium was not a primary outcome and the assessment tool used or the timing of assessments was not reported. The pathophysiology of delirium remains poorly understood, but there are a combination of pre-existing and precipitating factors that can predispose the patient to postoperative delirium.11 122 123 Pre-existing patient risk factors including age >70 years, pre-existing cognitive impairment, history of postoperative delirium, visual impairment, cerebrovascular disease and renal impairment124 125 are associated with higher risk of delirium. Precipitating factors can include acute injury such as a hip fracture, malnutrition, electrolyte imbalance and the use of urinary catheter and physical restraints.125 Specific perioperative risk factors include intraoperative blood loss, postoperative transfusions and severe acute pain.126 127 The studies that adjusted for confounders and reported delirium40 42 52 53 found no association between type of anaesthesia and postoperative delirium. Confounders adjusted for included demographics, ASA classification, comorbidities, nutritional status, fracture type, preoperative blood transfusion and readmission.42 52 53 However, with multifactorial risk factors for delirium, it is difficult to encompass all variables. Other important characteristics such as anaemia, time to surgery, blood loss, intraoperative hypotension and sedation can also influence outcome but were less frequently included as variables. Given the lack of consistency across studies in terms of number and type of variables included in models and the reporting of these, it is not possible to gauge the overall impact that adjusting for confounders may have on the direction of effect. There were limitations in the primary data included in this systematic review. There were a limited number of RCTs (3% of total number of patients included for the primary outcome) and many of the non-randomised studies did not make any attempts to adjust for potential confounding factors. When confounding variables were considered, this was often done for mortality only. There was significant heterogeneity across studies in study design, population age, comparators, assessment time-points and definition of outcomes (particularly delirium) that precluded quantitative pooling. Detailed reporting of anaesthetic techniques was suboptimal especially for GA techniques. RA techniques employed were more commonly reported, but the specific drugs used were not described. Opioids are known to cause delirium3 128 and acute pain is a well-recognised precipitating factor of delirium, but both were poorly reported. While most studies planned to collect adverse events data, it was unclear whether adverse events were predetermined. Small sample sizes (n<30) and rare occurrences of adverse events mean that many studies were likely underpowered.35 36 48 101 The style of data reporting in included studies could also lead to over-reporting of complications; for example, a patient could develop pneumonia, which led to respiratory failure and the need for inotropic and ventilatory support and ITU admission. Thus, five adverse events would be attributable to a single patient, but this may not be evident from the data. Incidence of intraoperative hypotension was not captured by POM categories, as inotropic support use was not reported. Hypotension can lead to hypoperfusion and organ damage. A recent analysis of data from an audit of outcomes in patients with hip fracture demonstrated increased risk of death associated with intraoperative hypotension. In our review, three studies106 108 109 examined hypotension, all of which found higher incidences of hypotension in the GA group. Four studies52 69 106 109 also found significantly higher volumes of fluids and blood products transfused in the GA group. Subgroup analysis was not feasible and no individual studies reported findings for different subgroups. It is possible that there are some patients who may, in some circumstances, benefit from RA compared with GA that have not been captured by the evidence presented in this systematic review. Subgroup analysis of specific at-risk patients, for example the frail and the very elderly, may suggest a benefit for either regional or general anaesthesia in certain population groups. Older patients are at high risk of adverse outcomes postoperatively due to age-related physiological decline, multiple comorbidities and polypharmacy.129 Principles of care for older patients in the perioperative setting should employ an anaesthetic technique that leads to rapid recovery, dosing of drugs specific to individual pharmacokinetic variation and appropriate pain management strategies.130 Most recently, the European Society of Anaesthesiology consensus guideline on postoperative delirium also did not find substantial evidence to recommend a specific type of anaesthetic technique but advocates intraoperative monitoring to avoid swings in blood pressure and excessive depth of anaesthesia.131 Given the lack of standardised assessment tools of delirium and the paucity of suitably powered, methodologically sound studies, uncertainty remains regarding any potential benefits of certain types of anaesthesia. However, even a modest reduction in adverse events and length of hospital stay could benefit many patients and result in cost savings for healthcare providers. Future research examining postoperative delirium should include robust assessment and diagnosis of delirium. There is also an urgent need for high-quality research comparing anaesthetic techniques that focus on patient-related outcomes such as quality of life and functional outcomes. We would like to thank Mrs Preeti Pulgari for her assistance with the review. National Institute for Health and Clinical Excellence. The management of hip fracture in adults. NICE Clin Guidel [CG124] 2011. National Institute for Health and Clinical Excellence. Delirium: diagnosis, prevention and management. NICE Clin Guidel 2010. American Psychiatric Association. Diagnostic and statistical manual of mental disorders. 5, 2013. Scottish Intercollegiate Guidelines Network. Management of hip fracture in older people, 2009.
. Anaesthesia for hip fracture surgery in adults. Cochrane Database Syst Rev 2016;2:CD000521.
. The Newcastle–Ottawa Scale (NOS) for assessing the quality of nonrandomised studies in meta-analyses. http://www.ohri.ca/programs/clinical_epidemiology/nosgen.pdf (Accessed 1 Apr 2016).
. The effects of related factors on one- and two-year mortality after a hip fracture in elderly Turkish patients. Trak Univ Tip Fak Derg 2010;27:127–31.
. The effects of anesthesia techniques on postoperative mortality in elderly geriatic patients operated for femoral fractures. Turk Geriatr Derg 2012;15:434–8.
. The use of a postoperative morbidity survey to evaluate patients with prolonged hospitalization after routine, moderate-risk, elective surgery. Anesth Analg 1999;89:514–9.
. [Postoperative delirium after general anesthesia vs. spinal anesthesia in geriatric patients]. Masui 2003;52:972–5.
. risk factors and cognitive functions in elderly hip fracture patients with general and spinal anesthesia. Turk Geriatr Derg 2012;15:273–8.
. Spinal anesthesia versus general anesthesia for hip fracture repair: a longitudinal observation of 741 elderly patients during 2-year follow-up. Am J Orthop 2000;29:25–35.
. General versus spinal anaesthesia and postoperative delirium in an orthogeriatric population. Australas J Ageing 2015.
. Hip fracture in the elderly: the effect of anesthetic technique. Orthopedics 1999;22:31–4.
. Effectiveness of postoperative pain management in hip fractures: a multi centre audit of current practice. Reg Anesth Pain Med 2017;42(Supplement 1):e74.
. Choosing wisely: Perhaps general anesthesia is not the safest option for hip fracture elderly patients. J Am Geriatr Soc 2018;66(Supplement 2):S311.
. Cognitive function and postoperative cognitive decline in hip fracture patients. J Am Geriatr Soc 2014;62:S87.
. Does anaesthetic technique influence postoperative ambulation after hip fracture? Anaesthesia 2010;65:1054.
. Outcome following fractured neck of femur—variation in acute hospital care or case mix? J Public Health Med 1995;17:429–37.
. Intertrochanteric hip fracture surgery in Chinese: risk factors for predicting mortality. Int J Clin Exp Med 2015;8:2789–93.
. Fractures of the neck of the femur. A prospective study of the early results. Ir J Med Sci 1980;149:457–64.
. [Mortality in patients with proximal femoral fractures during the first year after the injury]. Acta Chir Orthop Traumatol Cech 2002;69:39–44.
. Mortality risk factors in the elderly with proximal femoral fracture treated surgically. [Czech]. Acta Chir Orthop Traumatol Cech 2009;76:41–6.
. Impact of malnutrition on 12-month mortality following acute hip fracture. ANZ J Surg 2016;8686:157–61.
. In-hospital mortality in proximal femoral fracture surgery—does type of anesthesia matter? Reg Anesth Pain Med 2016;41:e34.
. Is early mortality related to timing of surgery after fracture femur in the elderly? Saudi Med J 2006;27:507–10.
. Anaesthetic technique and mortality for hip fracture surgery in the over 90s. Anaesthesia 2010;65:1055–6.
. Factors influencing postoperative mortality one year after surgery for hip fracture in Chinese elderly population. Chin Med J 2013;126:2715–9.
. mortality, and length of stay after hip fracture surgery. JAMA 2014;311:2508–17.
. [Comparison of general and epidural anesthesia in femoral fractures in persons over 60]. Rozhl V Chir 1988;67:94–8.
. Audit of patients admitted with fractured neck of femur. Anaesth Intensive Care 2012;40:1060–1.
. Risk factors influencing mortality after bipolar hemiarthroplasty in the treatment of fracture of the femoral neck. Clin Orthop Relat Res 1991;270:295–300.
. Mortality risk factors in the elderly with fracture around hip treated surgically. Osteoporos Int 2013;1:S350–1.
. Mortality rate and risk factor of patients with fragile hip fracture. Osteoporos Int 2014;25:S331.
. Outcomes after regional versus general anesthesia for hip fracture surgery in patients ages 90 years and above. J Am Geriatr Soc 2012;60:S145–S146.
. Long-term survival of surgically treated hip fracture in an Australian regional hospital. Anaesth Intensive Care 2005;33:749–55.
. A survey of emergency hip fracture analgesia and morbidity/mortality at Aberdeen Royal Infirmary. Anaesthesia 2011;66:42.
. Does an independent predictor of in-hospital mortality exist for patients with isolated proximal femoral fracture? A retrospective two-year observational study. [Czech]. Acta Chir Orthop Traumatol Cech 2015;82:288–92.
. Comparative effectiveness of anesthesia technique among older patients after hip fracture surgery. Pharmacoepidemiol Drug Saf 2017;26:358–9.
. Combined sciatic-paravertebral nerve block vs. general anaesthesia for fractured hip of the elderly. Middle East J Anaesthesiol 2000;15:559–68.
. The effect of anesthetic type on outcomes of hip fracture surgery: a nationwide population-based study. Medicine 2016;95:e3296.
. Hemodynamic changes associated with spinal and general anesthesia for hip fracture surgery in severe ASA III elderly population: a pilot trial. Minerva Anestesiol 2013;79:1021–9.
. Intraoperative hypotension—the influence of different types of anesthesia in urgent orthopedic surgery. Reg Anesth Pain Med 2014;1:e199.
. Hypotension during surgery for femoral neck fracture in elderly patients: effect of anaesthetic techniques. A retrospective study. Minerva Anestesiol 2008;74:691–6.
. Anesthetic technique and hypotension during hip fracture repair: a retrospective study of 2916 patients. 41st Annu Reg Anesthesiol Acute Pain Med Meet Am Soc Reg Anesth Pain Med ASRA 2016;41.
. Is spinal anesthesia with low dose lidocaine better than sevoflorane anesthesia in patients undergoing hip fracture surgery. Arch Bone Jt Surg 2017;5:226–30.
. Risk factors for discharge to rehabilitation among hip fracture patients. Am J Orthop 2015;44:E438–43. World Health Organisation. The ICD-10 Classification of Mental Behavioural Disorders—diagnostic criteria for research , 1993.
. Guidelines for the prevention diagnosis and management of delirium in older people in hospital. 2006. Contributors All authors have made substantial contributions to the manuscript. JY: conception and design of the study. VP, RC, JD, JY: acquisition of data, analysis and interpretation of data. VP, RC, JD, JY: drafting the article or revising it critically for important intellectual content. VP, RC, JD, JY: final approval of the version to be submitted. Funding This work was supported by the National Institute of Health Research (NIHR). JY is supported by NIHR Post-Doctoral Fellowship (PDF-2014-07-061). Data sharing statement There are no unpublished data from this review.